A member of the Liliaceae family, lilies are fragrant, bulbous, herbaceous perennials that are native to the northern temperate zones. About half of the lily species originate in continental Asia, while the remainder are native to Europe, North America and Japan. 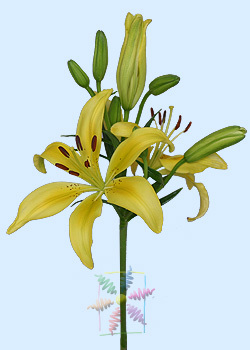 In ancient times, many cultures considered lilies to be signs of fertility and a pure life, and the flowers were used as offerings to appease the gods. White: Virginity, purity, majesty. It’s heavenly to be with you. Yellow: I’m walking on air. Happy. Pink stargazer lily: Daydreamer, pure of heart. Heaven in your eyes. Congratulations. Special Prep: Remove anthers as soon as the flower head opens to prevent pollen stains. Lilies are strong form flowers with equally strong lines, so even a few stems in a vase make a dramatic statement, and their look can range from country to English garden.